FOB PriceUSD 4000.0-12000.0/Set Get Latest Price ModelN450 Certification CE CapableROHS Min.Order1set Brand NameJAGUAR AUTOMATION Brief DescriptionEfficient, energy-saving, lead-free, environment-friendly, safe and brand-new design, simple operation, convenient maintenance. 2.Automatic power system, frequency converter control, automatic board input system. 3.Flux sprays system using scanning spray nozzle, Japanese nozzles and rodless pneumatic cylinders and PLC control, accurate and reliable. 6.Tin stove adopts imported high frequency conversion motor independent control, stable performance. 7.Lead-free solder furnace with independent design, environmental protection and safety,e asy to clean. 9.Time can be controlled, we can preset switch functions, tin stove can heat within 90 minutes. 10.With black box memory function, the machine can always store the production management records, improve work efficiency. 11.Automatic claw cleaning function ensure the cleanliness of claws. 12.Reasonable design and sensitive fault security alarm system ensure the stable performance and operators’ safety. 13.Nitrogen Structure(optional): High accuracy Oxygen analyzer, Nitrogen consumption of 16m3/hr based on 300-500ppm. In purchasing the products, we promise to allow customers to clearly know the completion of the product. In strict accordance with the relevant provisions of the contract terms of production, delivery, to ensure product intact and in place within the stipulated time to customer requirements. Product during the warranty period, under normal storage, maintenance, use, if quality problems, responsible for the free repair or replacement, and provide the relevant maintenance knowledge; as a result of improper use or damage caused by the product does not work normally, the Company provides paid service. Product warranty period is not, it will provide a paid service. 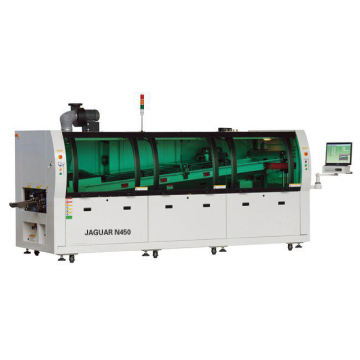 Shenzhen Jaguar Automation Equipment Co., Ltd (referred to as "Jaguar") is a High-speed developing enterprise of High Precision Automatic lead-free Equipment such as reflow oven and wave soldering machine manufacturer, which specializes in lead free machine research and development. As one of the well-known lead-free electronics equipment manufacturers in China, JAGUAR was founded in 2009 and headquartered in Shenzhen. B. Trade assurance to US$900,000 ! Lead time: 20 work days after 50% TT deposit payment confirmed. The mode of transportation is generally by sea, if the customer need to ship the products by other way , it also can be accepted. Shenzhen Jaguar Automation Equipment Co., Ltd (referred to as "Jaguar") is a High-speed developing enterprise of High Precision Automatic lead-free Equipment such as reflow oven and wave soldering machine manufacturer, which specializes in lead free machine research and development for years. Factory Info: Shenzhen Jaguar Automation Equipment Co., Ltd.
Shenzhen Jaguar Automation Equipment Co., Ltd (referred to as "Jaguar") is a High-speed developing enterprise of High Precision Automatic lead-free Equipment such as reflow oven and wave soldering machine manufacturer, which specializes in lead free machine research and development for years. As one of the well-known lead-free electronics equipment manufacturers in China, JAGUAR was founded in 2009 and headquartered in Shenzhen.so, what we can do for you and what kind of services we can offer?1. we can provide full SMT solution.2. we can provide you with top technical support.3. we have enrich experience on SMT factory set up.4.we can provide the best professional tech service.5.we can help you to deal with all the trouble about SMT.6.we are committed to provide the best solution to our clients. Services and products:Our company is professional in manufacturing wave soldering machine and reflow oven,besides both two kinds of products, we also engaged in offering SMT conveyor, pick and place machine, LED equipments, PCB loader and unloader, solder paste and other SMT machines.